Enjoy 40 minutes in a 3-seater sauna within a locked private room. We provide a towel to sit on, one to use and a small refreshing eucalyptus towel for after your session. Wear swimwear or use a towel. Choose your temperature. Listen to meditative music, an upbeat station or sit in silence. Sweating starts within 20 minutes and deep sweating happens with multiple sessions. Loose clothing to change into afterwards is suggested. 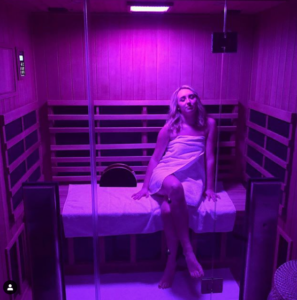 Included in our infrared saunas is chromotherapy. Light Therapy is a great way to revitalize and energize. Stay hydrated. The sauna can be considered a passive workout as well as a healing experience, and replenishing yourself is a must. 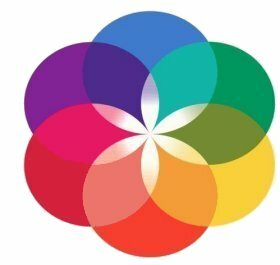 Chromotherapy, or color therapy, is the science of using colors to keep the body in balance. Booking on the hour and how long is a session? Operationally, we currently book on top of the hour so clients can enjoy a full 40 minutes. We allot a couple minutes to get in sauna and approximately 5 minutes to change afterwards to keep on schedule. If arriving late, we may have to deduct time. If you want more time after session to get ready, you can reduce time in sauna. The private sauna room is the changing room. We don't have additional space to change so please make sure you are comfortable if you book a Social session. We do not offer showers. It is recommended to let the body cool down and pores close for at least 30 minutes after session before showering. The more skin exposed to the infrared, the better. Most Single sessions use a towel only. Some Social sessions prefer to use loose clothing, minimal athletic wear, or a swimsuit. You may want to bring loose clothes to change into. We offer 1 towel each which is sufficient for most clients. You can rent additional for $2 or bring your own if you require more. How often should I visit? Will I sweat first session? Difference between infrared and traditional sauna? The difference is the heat source. The average temperature of the infrared sauna is 125-140 degrees and heats the body. The client can control the temperature. The traditional sauna uses electric or hot rocks to heat the air to 175 degrees plus. The purpose of infrared sauna is to give you maximum benefits at a lower temperature.